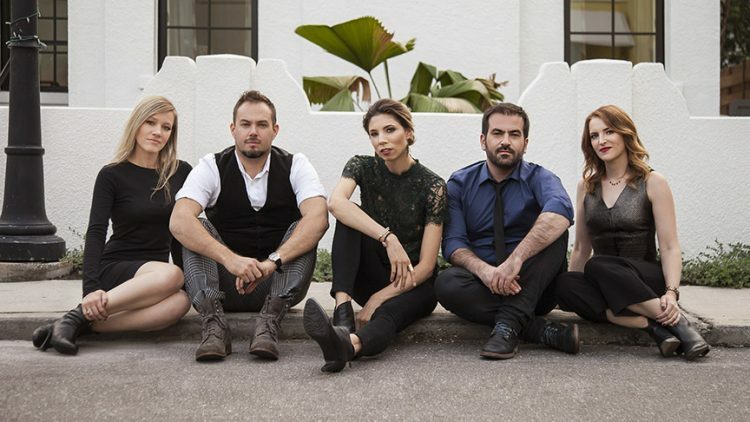 The dynamic quintet SYBARITE5, winner of the 2011 Concert Artists Guild International Competition, will present its latest album “Outliers” at the Ent Center for the Arts Oct. 12. “Their rock star status…is well deserved,” wrote the Sarasota Herald Tribune. “Their classically honed technique mixed with grit and all out passionate attack transfixes the audience.” Comprised of Sami Merdinian and Sarah Whitney, violins; Angela Pickett, viola; Laura Metcalf, cello; and Louis Levitt, bass, SYBARITE5 has taken audiences by storm all across the US, forever changing the perception of chamber music performance. From the moment their bows hit the strings, this quintet of talented, diverse musicians takes the audience on an exciting ride that engages the senses and redefines the rules. SYBARITE5 has appeared at the Library of Congress, the CBS Early Show, for his Holiness the Dalai Lama, and numerous times at the Aspen Music Festival. In New York City they have performed at Lincoln Center, Time Warner Center, Galapagos Artspace, Tishman Auditorium, Bohemian National Hall, the Core Club, the Cutting Room and maintain a residency at the cell, “A 21st Century Salon.” SYBARITE5 was the first string quintet admitted to the Aspen Advanced Quartet Studies program, where they worked with Earl Carlyss of the Juilliard Quartet, bassist Edgar Meyer, as well as the Cavani, American and Ying String Quartets. Ongoing programs include the Radiohead Remixed Project, the Shuffle Effect, New Music IDOL, an Alternative Venues Initiative and the DIDO Project. The quintet’s debut album, “Disturb the Silence,” quickly reached the top ten on the Billboard charts. The group’s follow-up album, “Everything in its Right Place,” was released at Carnegie Hall to critical acclaim. SYBARITE5 recently completed its latest album, “Outliers,” featuring all new works from American composers. With the Artist Series’s second season, UCCS Presents continues bringing the best performing artists to Colorado Springs. Tickets are still available for this lively performance in the Chapman Foundations Recital Hall.